The Agora SDK v2.3.0+ provides a setVideoEncoderConfiguration method for users to set the video profile. This method includes an orientationMode parameter for users to set the video orientation mode. This page shows you how to set the video orientation mode in various scenarios. The following figure shows how the Agora SDK captures, processes, and outputs videos. Video rotation involves the video capturer and the video player. Relative position of the video and the status bar. The video player renders the received video information. After you have joined the Agora channel, use the setVideoEncoderConfiguration method to set your preferred video profile. The VideoEncoderConfiguration class includes an orientationMode parameter to set the rotational mode of your video. 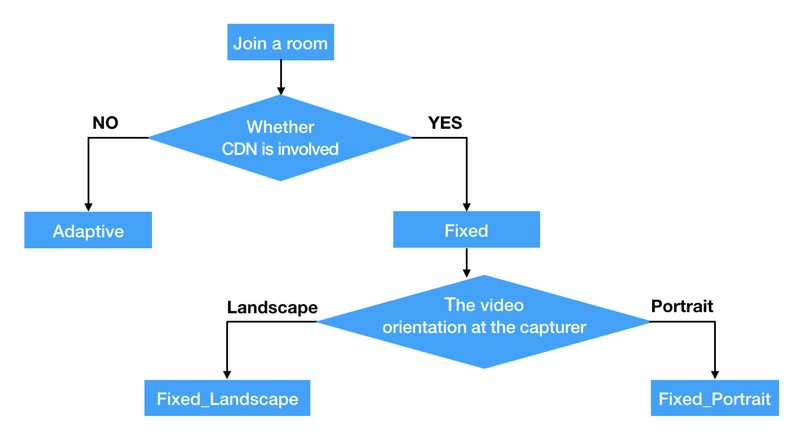 Agora recommends using the following flowchart to select your video orientation mode (applicable to both Communication and Live Broadcast scenarios). The orientationMode parameter provides three modes, ADAPTIVE, FIXED_LANDSCAPE, and FIXED_PORTRAIT for different user needs. The relative position of the video and the status bar on the video capturer and the player remain the same for all modes. In the adaptive mode, the video capturer captures the video frame and sends the video together with its relative position to the status bar. The player notes the relative position and renders the video frame. The following figures show the video orientations at the video capturer and player when a rear camera is used as the video capturer. Note that the video orientation differs according to the UI lock of your app. The relative position of the status bar remains the same as the screen and not according to the phone tilt (for example in WeChat). Therefore, the relative position of the video and the screen remains the same for the video capturer and the player. The status bar of the app remains horizontal, regardless of the orientation of the screen (for example in Facetime). Therefore, the relative position of the video and the phone tilt remains the same for the video capturer and the player. In the Fixed_Landscape mode, the video capturer sends the video in the landscape orientation relative to the status bar and video cropping may be necessary. The player renders the received video frame directly without rotating the video. In this mode, both sides of the captured video will be cropped in the direction perpendicular to the status bar. The following figures show the video orientations at the video capturer and the player when a rear camera is used as the video capturer. In the Fixed_Portrait mode, the video capturer sends out the video in the portrait orientation relative to the status bar and video cropping may be necessary. The player renders the received video frame directly without rotating the video. In this mode, both sides of the captured video will be cropped in the direction parallel to the status bar. See the description of the setVideoEncoderConfiguration method in Video Call API for more information.